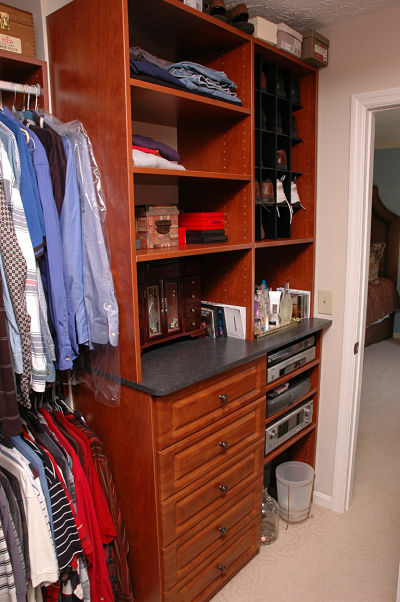 Think of your walk-in closet as a small personal room. You want it to be efficient and match your personal style and needs. This is why design is so important. There are many new accessories and design configurations that can improve the efficiency of closet space and storage. Begin by assessing what you need to store and items that cannot be hung on rods, i.e. shoes, scarves, knits, jewelry. What type of unit and capacity would be best for these items? It may be helpful to work with a designer to identify your options and to help personalize them to your preferences. Walk-in closet with an island. Photo courtesy of California Closets. 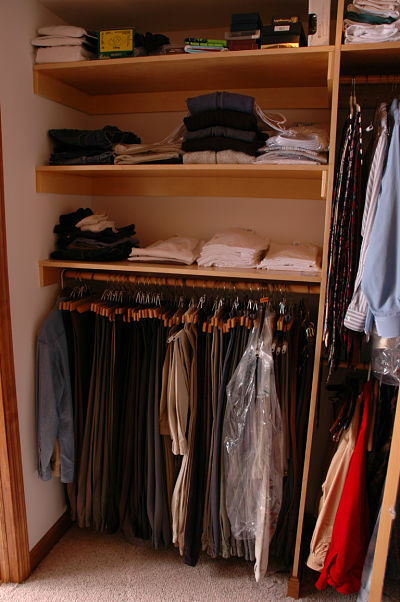 The typical closet has rods and shelves installed on two or three walls. If you have the space, why not create storage in the center? Cabinets with drawers and shelves can be used to build an island in the closet for storage. A central shelf unit is another option to consider. 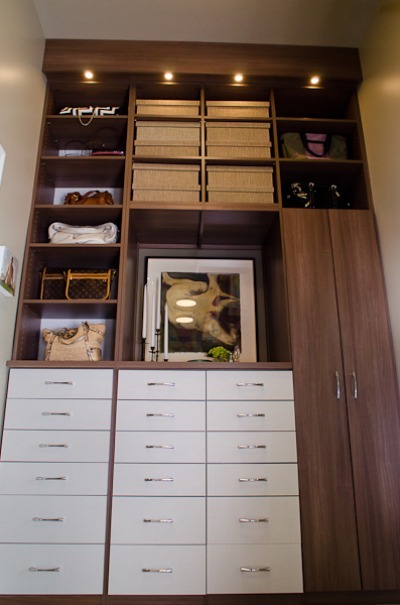 A double tall cabinet shelving unit was added to this walk-in closet for storing shoes and knitted clothing. The top of the unit can also be used for storage. Cabinets work well in a kitchen or bathroom, so why not the closet? Storage drawers help to contain small items and can be fitted with organizers. Counters can be used to lay out accessories or provide an additional surface for items you may want to have at hand. Open shelves are versatile and can be adjusted to stack jeans, sweaters or other items. A wood stained cabinet unit in this closet includes a solid surface counter, drawers and adjustable open shelves. Jewelry can become tangled, damaged or lost when stored in a traditional jewelry box. There are closet accessories and drawer inserts made of soft fabric designed expressly for jewelry storage. Pullout rods with hooks for keeping necklaces from becoming tangled are essential for those who enjoy adding a touch of "bling" to their wardrobe. 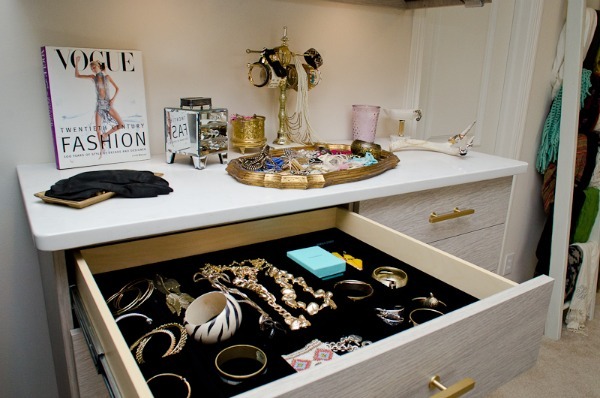 This in-closet chest has a counter for storing jewelry and drawers with velour inserts for storing precious metals. Photo courtesy of California Closets. Shoes often get lost in closets. Having organized shoe storage is a must. Open shelving with an edge can help keep shoes in place. There are also cubbies that can be used for shoe storage and even deep drawers for storing dress boots that are now the latest rage in fashion. 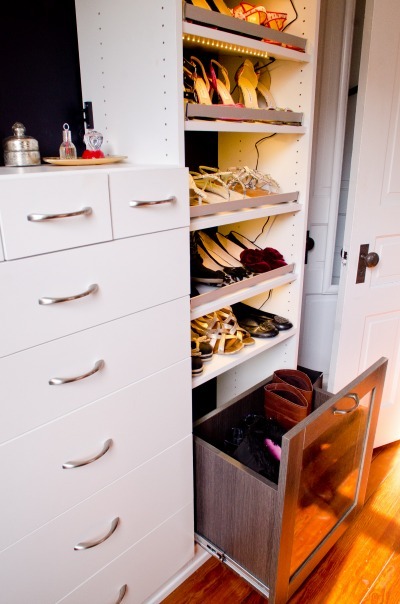 This closet has open shelves for storing women’s shoes and a deep drawer for boots. Photo courtesy of California Closets. Rods and shelves can be organized in a closet to make the best use of the storage space. A closet can be framed for rod placement and shelving. Closet insert dividers were used to configure this closet. Rods were hung at various heights to take full advantage of the available space. Shelving was placed according to the storage needs of the homeowner. 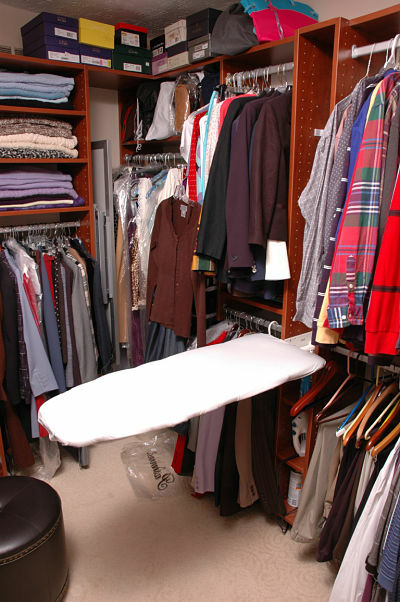 A closet can be a convenient place to store and use an ironing board. A flip-down ironing board was installed as part of this closet insert. Cubbies below provide storage for the iron and spray starch. 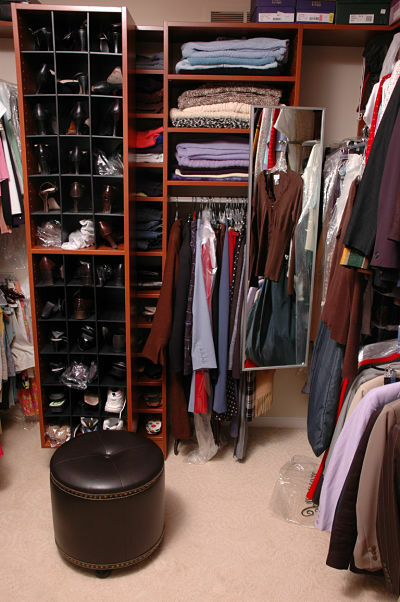 A closet is a good location for a full-length mirror to check your appearance. 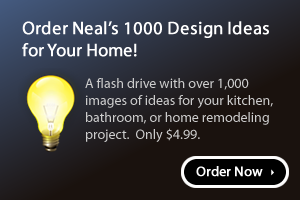 It can be installed on a door, wall or as a pullout. This mirror in a walk-in closet is on a hinge and can be pulled out and stored neatly after use. There are many new closet accessories that help keep a closet organized and functional for both clothing storage and care of contents. Durable hangers in appropriate sizes are a great accessory to add for blazers, pants, dresses and even scarves and shawls. Pullout rods can be used for coordinating wardrobe or to air clothes after wear. Pullout hampers and tie/belt/jewelry hangers are also handy accessories to add. This closet features a pullout rod for hanging wardrobe items and durable hangers in a variety of sizes. Photo courtesy of California Closets. LED and compact florescent lights make it possible to add task lighting to closets. They emit less heat and do not produce ultra-violet radiation that causes colors to fade. It is important to have lights installed properly when using them in closets to assure that lighting is within code and to prevent a fire. LED lights installed in this closet insert help illuminate contents. Photo courtesy of California Closets. Color can add style to any room, even a walk-in closet. A closet is your personal space so why not brighten it with a pop of your favorite color on the walls, ceiling, floor or on an insert? 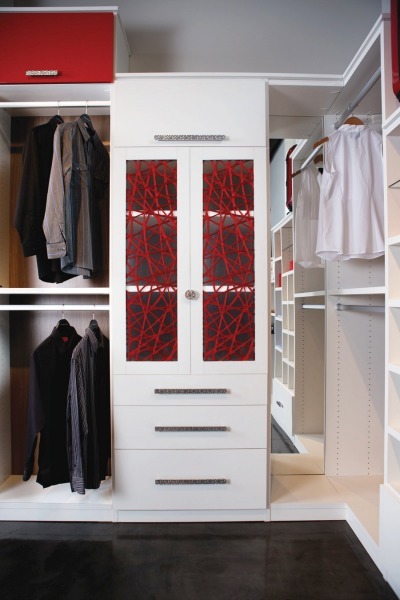 Red was used on insert cabinet fronts in this closet. Photo courtesy of California Closets.